It’s a helpless feeling..really.Chennai is suffering due to heavy rains caused by Cyclone Nisha..there’s knee deep water everywhere,no electricity and hence water shortage too..things in the fridge are rotting..I feel terrible.Plus,I don’t feel like complaining when I see the incidents happening in Bombay..God..misfortunes do come together!! Electricity has made an entry after 30 hours and I don’t know how long it will last.Even though I don’t feel like cooking anything,I just baked a batch of cookies to have with tea.I often remark about the lesser lighting in the kitchen,after cooking a few meals in darkness with the help of one candle,I feel the kitchen has never looked so bright!!! Powder the sugar and cinnamon piece together to a fine powder. Cream butter and sugar-cinnamon mix till fluffy. Add the flour little by little and knead into a soft dough. If the mix is too dry,you could add a few tsp butter. Roll out the dough to about quarter of inch in thickness and cut into shapes using cookies cutters,or shape into circular discs with hand. Bake at 150*C for 20 minutes(That is the normal baking time for cookies of our taste-crispy yet melt in the mouth,you can bake it according to the temperature settings of your oven). Sprinkle some sugar on top immediately after taking out from the oven(optional). Lets peep into our fellow marathoners kitchen to see what they've been cooking!! 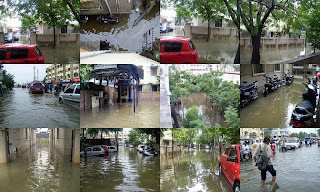 And a small peep into what our locality looked like for about two days!! Divya, those cookies look very tempting:) I must say, you did the best under these circumstances with power cuts. And about cooking with a candle in kitchen, wow I can imagine how happy you must have felt to have the light restored. Cyclone Nisha? I didn't know that they have started naming cyclones in our country... but yeah, I heard about the rains and it is pretty bad. Divya, the cookies look great! Thks for sharing..shall bake these.. Didn't know abt cyclone in Chennai!The pic really reminds of Mumbai rains of 2005! How true reg. the terror of 3 nights 4 days..were glued to NDTV. It melts away leaving yummy flavour of coconut n almond-- i used the sliced almonds n crushed it in ziplock bag, gives more flavor than the mixie crushed ones..thks again for sharing ur cookies..drooling ! Stay safe..rgds. Cookies looks very yummy Dhivya, Hope you are doing ok after the cyclone, hope everthing is getting back to normal. Take care. I am so sorry to hear abt ur story...really irritating to cook with only a candle light to help u move around the kitchen...Cinnamon cookies must have made up for it huh :)...perfectly baked and crunchy ones..
Wow Divya, awesome cookies and I love the cinnamon flavour.They look so scrumptious. wow! it looks as it is we buy from stores! you are a professional baker! u haven't tell me what kudua in ur name refers to? visit my blog when u find time!